The ascent is approximate and there were no details of starters or finishers or times for other entrants. The route started from the Swythamley & Heaton Centre and headed to Gun Hill before crossing farmland to the Roaches to traverse the ridge; there was a diversion this year to Lud's Church then Gradbach; past the Three Shires Head and along the Cumberland Brook; a loop up and down Shutlingsloe prior to a well-stocked checkpoint in Wildboarclough; a seven mile loop across mainly farmland and back to the refreshments at Wildboarclough before heading back to the finish from where the fun started earlier in the day. This was a LDWA challenge event and not a race as such but rather a day out to see if the course could be completed within the cut-offs.At the end there were more refreshments. The weather had been dry throughout and quite mild for the time of year with good visibility.It was wet underfoot in places. The Haworth Hobble is a race for singles or pairs with mostly single runners taking part. There were 313 finishers (including pairs) and since some started as pairs the actual number of finishers was 351. It is not known whether the 24 DNF's were 12 pairs or 24 singles or some other combination. During the event there were hot dogs, doughnuts, whisky and other refreshments. The weather had been dry throughout and quite mild for the time of year with good visibility. It was very wet underfoot in places with patches of snow remaining here and there. The race was summed up by the conversation I had with the bloke at the end taking numbers. He said 'We were puzzled to begin with as you were all a lot slower than usual but you all looked like you had been working hard.' Yes, that would be the fault of the conditions; a choice of running through 3in of stream water along the path or taking your chances in the 3/4in + mud down the sides of the path. Twice, whilst running across a sopping wet field I did feel sorry for the people at the back; would they actually be able to run through the morass left by the 300+ people running before them?! Whilst I did set off too fast as usual I realised this earlier than last year and slowed so avoided running the last half in post-crash purgatory. The biggest disappointment though was the lack of donuts at the end - last year there were 6 banana boxes piled high with them (which was a regrettably missed photo opportunity) whereas as although there was stew and heaps of pasta, the only sugar I could see were a few cupcakes - a healthier slant to their post race food I wonder?!" Starting in Askham the route generally follows footpaths and bridleways to St Peter's Church near Martindale; Boredale (Boardale on the British Mountain Map); Patterdale; Sticks Pass; Stannah Beck; Swirls car park; Birkside Ghyll; Raise Beck; Grisedale Tarn; Patterdale again and back to Askham. Visibility was generally good. Higher parts of the course were blessed with an abundance of snow and sheet ice lurked in patches to give runners winter conditions. In the absence of strong winds and precipitation the conditions seemed quite mild and the ample spare layers taken just in case remained unused (but wisely taken just in case). There was sufficient snow to inspire a profusion of skiers who could be seen carrying skis to enjoy the conditions. On the ascent towards Grisedale Tarn on the path up Raise Beck Santa Claus was merrily snapping photos of the runners (which can be seen on the Facebook page of the event accessible via the event website). Recent snowfall was evident on most of the course and there was a flurry of snow at the start but that soon eased off. On the hills there was plenty of snow to make it a magical day out. Particularly lower down snow had melted and frozen again to give patches of sheet ice. Generally the route offered a choice of loose gravel and slippery rocks or wet grass and mud or sheet ice. At one point I went skidding along on a patch of sheet ice and slammed into a large rock causing a Kendal mint cake to sustain a double fracture and dislodging the cherry from the icing of my bakewell tart. Fortunately I bore most of the impact on my arm, shoulder and head so a packet of Eccles cakes escaped totally unscathed. With the race HQ at Marsden a 30 mile loop was fully sign-posted so entrants didn't need to navigate around the course but just keep a close watch on the arrows and signs around the route. The 60 mile event was two laps of the same loop and the 100 mile version involved three laps followed by an extra smaller 10 mile loop. There was enough elevation to qualify as a CL fell race but the easy trails and roads made it more of a trail race. The weather was cool with no rain and good visibility. The White Rose Ultra 30 was the final race in the Runfurther series of ultra races. Dark Peak Fell Runners were 6th for 2017. A trail run around Rotherham following the Rowbotham's Round Rotherham footpath mostly over farmland and rural areas on sign-posted paths, bridleways and roads with very little ascent. The weather was unseasonally hot and very dry. Temperatures were said to be around 20˚C! The course follows the Offa's Dyke national trail path from near Chepstow in South Wales to Prestatyn in North Wales. The route roughly follows the boundary between England and Wales and crosses numerous counties in both England and Wales; passes several towns and villages and ascends various hills including the Black Mountains and the Clwydian Range giving a cumulative ascent and descent surpassing sea level to the summit of Everest. There was a 90 hour (6 hours short of four days) cut-off with any resting or sleeping eating into the time available. The race started at 8 pm on Friday 15 September 2017 and by then it was already dark. Before the first checkpoint the runners were setting a fast pace through woods with tree roots coiled like serpents ready to trip any unwary runners not paying close attention to foot placement. By dawn the participants were running or walking over the Black Mountains and thereafter going up and down various hills one after another through the day and night and day and night again. Going over the Clwydian Range I diverted to explore the Jubilee Tower and view the sights before re-joining the race for yet more night running. At the finish at the Nova Centre in Prestatyn the successful athletes could be seen unconscious and frozen in time like the victims of Pompeii with bodies in suspended animation and captured in the act of whatever they were doing when the volcano struck. So it was at the Nova Centre with exhausted runners having fallen asleep in various poses such as on top of a sleeping bag asleep before they could crawl inside it; a sock half on and asleep on a chair; face first in a finisher's meal slumped across a table; prostrate on the floor around the building; sprawled next to a mobile phone with a conversation terminated abruptly by sleep and so on. The weather had been reasonable and mostly dry but with some rain from time to time. Special trophies were given to Jon Dufty and Steven Jones as Double Finishers (both finished in 2016 and 2017). The next King Offa's Dyke Race will take place in 2019. After this year the event will take place bi-annually. Most runners were from Great Britain but other nationalities included South Africa, Slovakia, Sweden, Belgium, France and Finland. There is also a Short Course option which is only 58 km with only 3,000 metres of ascent. It is possible to register for the Short Course or for those feeling the pace at Checkpoint 2 to divert to the Short Course from the Long Course to avoid The Black Mountain, Fan Gyhirych and Fan Nedd. Transferred to the Short Course: ?? Weather: Dry to start with then rain, light rain and heavy showers. It was quite breezy and towards the end the winds got stronger. At night there was mist on the hills. The Storey Arms was used as a checkpoint on the way out and on the way back with a drop-bag facility (last year the checkpoint on the way out was at the foot of the path coming off the Pen y Fan track and the drop-bag was at about the half-way point). There were also pairs of runners with the fastest pair finishing in 9:54:45. Weather: Warm with a few clouds and good visibility. No rain at all! The route embraces some interesting and varying scenery from both the White Park and Dark Peak areas of the Peak District.It starts in Bradwell with a gradual ascent to the Limestone Way before descending to Castleton via Cave Dale; then over Hollins Cross and down to Edale before a climb to the Druid's Stone on the Kinder plateau; up Lose Hill and around the edge of Win Hill and across to Bamford; past Dennis Knoll to run along Stanage Edge followed by Upper Burbage Bridge and Burbage Bridge; past Upper Padley and Leadmill before a trail along Abney Clough then up and over and back down to the finish in Bradwell. The weather was mainly cloudy with occasional showers. There was also a Half Tour of Bradwell of about 16 miles and 3,000 feet of ascent representing a truncated version of the Long Tour of Bradwell. 141 out of the 142 starters finished. The race timing was provided by Racetek. Full details of splits and the ability to filter the results into categories is on the internet under "Results Racetek". The occasional checkpoint location was not registered for some runners despite being "dibbed". However, the timing and the layout of the results was good overall. The route started and finished at Coniston with a circular tour of the Lake District taking in Seathwaite, Eskdale, Wasdale Head, Black Sail Pass, Buttermere, Braithwaite, Blencathra Field Centre, Dockray, Dalemain, Howtown, Haweswater Reservoir, Kentmere, Ambleside, Chapel Stile and Coniston Fells. The route consisted mainly of paths and trails and much of it was boggy and underwater which added to the interest. Weather: Dry for the first half hour or so before drizzle set in which gave way to rain. Then there was more rain and it eased off before raining again. On Saturday afternoon the sun came out and it was quite warm before the rain started which got heavier later. There was a shorter version starting at Dalemain of just 50 miles. The event starts and finishes in the Carding Mill Valley, Church Stretton and involves a tour of some fine hills in Shropshire and briefly across the border into Wales. The climbing starts straight away to Pole Bank on The Long Mynd. Then across country for an ascent of the ancient volcanic mound of Corndon Hill with its various burial cairns (some iron age and others for ultra runners who failed to reach the summit checkpoint). The survivors then tackled the jagged and uneven "path" on the Stiperstones on the way to Earl's Hill. There was easy running on the Betchcott Hills back to Carding Mill Valley and the half-way point. After road and trail to Easthopewood contestants had to pit their wits against cornfields lacking cleared paths along rights of way and follow tractor tracks to somehow find hidden stiles in overgrown hedges. Things improved running along Wenlock Edge until a pile of leaves turned into snakes and bees; a scarecrow came to life and starting chasing me and a 3,000 foot chasm opened up at my feet; at that point it occurred to me that there was a slight possibility that I may be hallucinating! After a 20 minute nap at the next checkpoint normal service was resumed to tackle the last few hills before an ascent of The Long Mynd again via Knolls. A final downhill dash led to the finish where the fun began the day before. Weather: Very hot - even at night. A tour of trails, paths, roads, hills and so on in the heat of the cruel and merciless sun of the North York Moors. The checkpoints were bountifully stocked with a variety of delights to both sustain the entrants and delay their progress while indulging in the sumptuous banquet. A five day stage race covering the mountains of Wales. The first day includes all the Welsh 3,000's and the route works its way south covering just about all the rest of the mountains in Wales. Conquest: Caer Caradoc Hill; The Wilderness; Willstone Hill and Gaer Stone. Death: A double ascent of The Long Mynd. Famine: Out to Wenlock Edge then back over Ragleth Hill. The loops could be completed in any order and, indeed, in a clockwise or anti-clockwise direction so long as all the self-clip checkpoints on the course were duly clipped into the race "passport". The permutations meant that at the start runners scattered in all directions and it was never possible to know where you were in relation to other competitors until the end. With everyone coming back to the race HQ at the end of each loop the organisers only needed one main central base to monitor proceedings and keep the runners fed and watered. Weather: Initially warm but on the second loop the rain started but eased off. On the third loop the rain was very heavy but it was dry again on the final loop. Starting at Askham the route visited the summits of Loadpot Hill and High Street before passing Angle Tarn on the way to Patterdale. A steady trail up Grisedale led to Grisedale Tarn then a rocky path continued down to a fast track to the Wythburn Church car park. The ascent of Helvellyn took the race past an inevitable swarm of tourists then along to Whiteside before descending to Glenridding and back past Patterdale. Place Fell was the final peak to be tackled before a return to the start via Martindale Church. The weather was very hot; too hot to run fast but extremely good visibility giving superb panoramic views. Dark Peak Fell Runners remain in third place after the third race of the series for 2017. 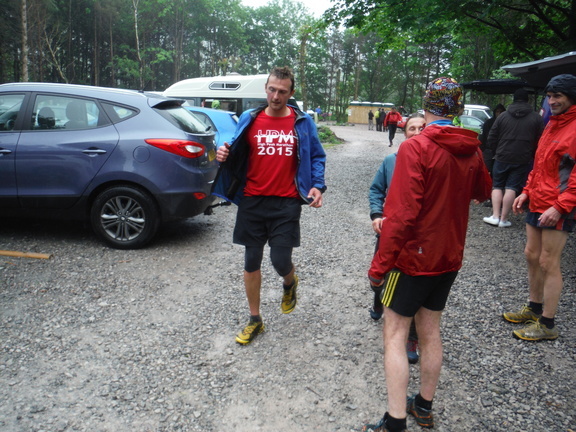 There were also walkers on the long course and a shorter course of 26 miles for both runners and walkers. The weather was mostly warm and dry but there was heavy rain before crossing the M62 by Windy Hill although it eased off fairly quickly then stopped. The Runfurther results so far show Dark Peak Fell Runners in third position. The weather was dry throughout and quite mild for the time of year. With good visibility and kind conditions the running was straightforward. The Haworth Hobble is a race for singles or pairs with mostly single runners taking part. No details of the number of starters or those retiring are available although quite a few did retire. During the event there were hot dogs, doughnuts, whisky and other refreshments. 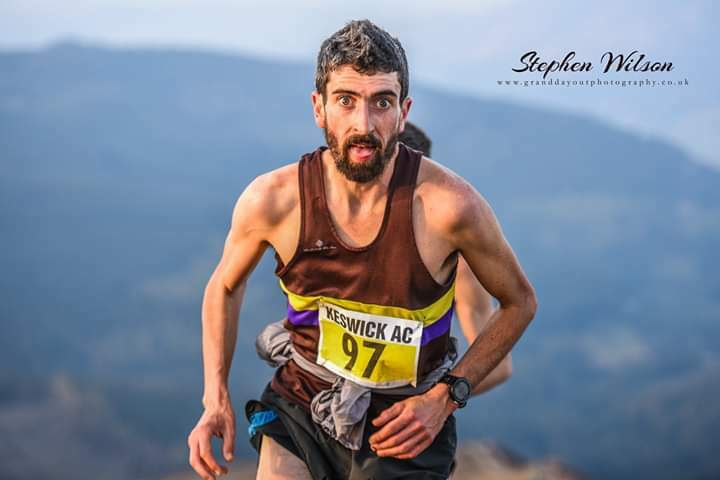 This year's race was used as the British Trial for IAU World Trail Championships with some good runners entering and six men breaking the course record and eight finishing in under four hours. Due to a route diversion inspired by heavy floods the revised route for the day was about 42 miles. The path involved was completely inundated and it was not possible to see where the riverbank path or the river was and tackling the original route would have involved the use of scuba equipment. There was heavy rain at the start but it eased off later.The ground conditions were very wet indeed and lots of fields were flooded and very muddy.It was hard going. The Spine Race event consists of the full Spine Race involving a 268 mile (431 km) adventure up the Pennine Way starting in Edale and finishing in Kirk Yetholm in Scotland with an ascent along the way of around 13,195 metres (36,729 feet).There is also a "fun run" version called the Spine Challenger which lasts a mere 108 miles and finishes at Hawes (as does the Spine MRT Challenge). 260 runners from 22 different countries took part in the three versions of the Spine Race events.It is regarded as a gruelling race due the winter weather conditions; it being dark for most of the time; navigation; sleep deprivation and the terrain. The Spine Race started with rain and snow and passed numerous fell runners coming the other way on the Marsden to Edale Trigger.There was plenty of scope to wade through icy streams and rivers on the Kinder Plateau, Bleaklow and Black Hill before settling down to more benign conditions.A number of runners were swept away in the torrents but were rescued by other runners or made it out on their own.For those taking part it was a memorable experience. Starting in Askham the route generally follows footpaths and bridleways to St Peter's Church near Martindale; Boredale (Boardale on the British Mountain Map); Patterdale; Sticks Pass; Stannah Beck; Swirls car park; Birkside Ghyll; Raise Beck; Grisedale Tarn; Patterdale again and back to Askham. There were quite a few runners eagerly anticipating some wild winter weather featuring snow, gales, driving rain, poor visibility and generally exciting conditions. They were denied the chance to test themselves in adverse weather conditions since there were fairly clear skies; no rain or any form of precipitation whatsoever and good visibility. The unseasonally mild conditions while disappointing some runners did enable the scenery to be appreciated in full which was well worth looking at. A circular route commencing in Lymm near Warrington on a flat course following paths and trails albeit boasting huge puddles and mud courtesy of inclement weather the night before. In addition to solo runners there were also pairs and relay teams of four taking part. This was the final race in the Runfurther series of ultra races. Dark Peak Fell Runners were 7th for 2016. The race started at dusk on Saturday (5:40 pm) at Hope College in Hope and participants initially visited the summit of Lose Hill before passing through Castleton and up Cave Dale along the Limestone Way to Miller's Dale and then Earl Sterndale. After wading through some bogs the route took in Shining Tor, Cats Tor, Windgather Rocks, Taxal Edge and Eccles Pike before the village of Chinley. The last part of the route went via Cracken Edge to Lord's Seat, Mam Tor and Hollins Cross before descending and passing the edge of Castleton back to the finish at Hope. Having run through the night the objective was to finish before dawn or at least in the twilight. There was also the option of a marathon or half marathon route for those not wishing to run throughout most or all of the night. The weather was reasonable with no rain albeit a little bit cold but there was lots of fog and mist and in some parts it was so thick that it was barely possible to see the ground a few paces ahead let alone any landmarks or scenery. A trail run around Rotherham following the Rowbotham's Round Rotherham footpath mostly over farmland and rural areas on sign-posted paths, bridleways and roads with very little ascent. The weather was mild and dry.